As usual, there’s more detail if you click on the image. By the way, here’s the real deal, just in case you think I made any of this up. Yeah!!! I wish someone would try this again with modern special effects. The zombie should be more bitey. 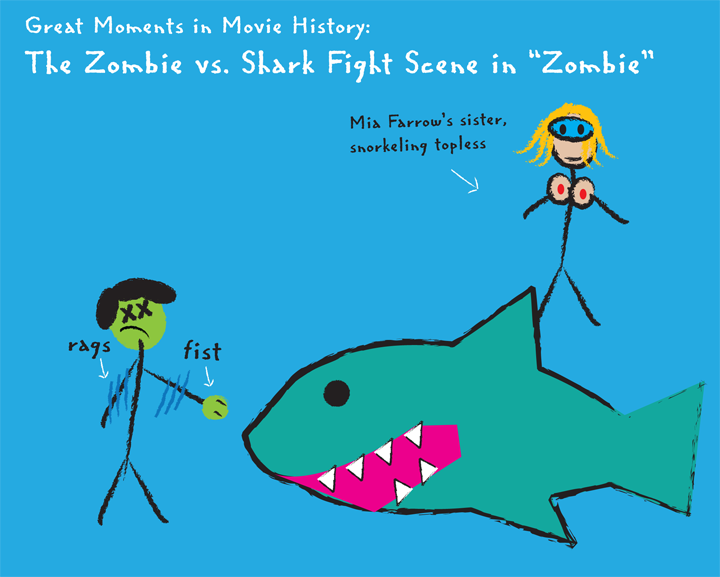 The “Zombie fighting a Shark” tag is hysterical. Your artistic rendering so perfectly captures the scene’s finer elements. It really is one of the great moments in movie history! They don’t make em like they used to…Zombi 2 is a beautiful thing! The awesomeness of this particular scene almost brings a tear to my eye.